청주시에 현재 1년 이상 계속 거주하고 있는 사람. 청주시에 과거 3년 이상 거주하였고 현재 1년 이상 계속 거주 하고 있는 사람. 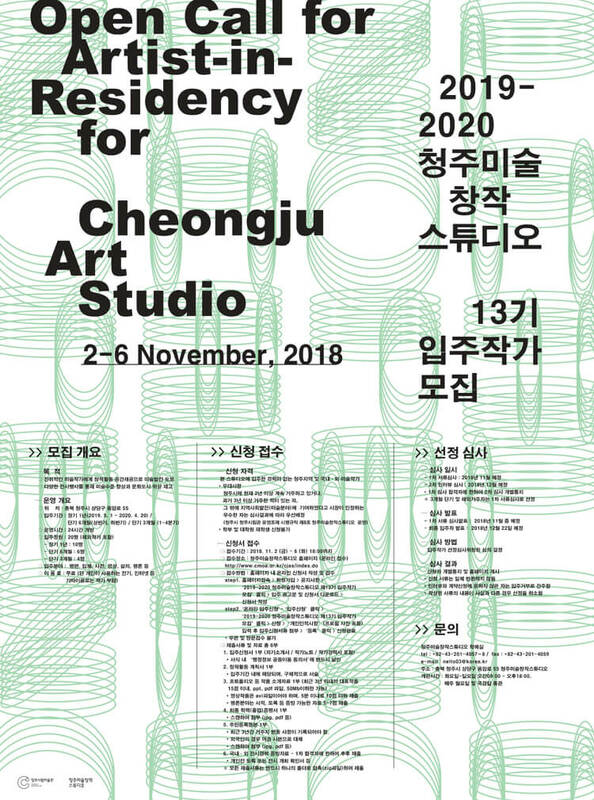 The Cheongju Art Studio is run by the city council of Cheongju, Korea. It is designed to provide an ideal working space with diverse programs for both domestic and international artists. The fundamental purpose of the residency is to encourage the artists personal artistic growth and interaction with the works and ideas of fellow artists. Through active discussion they will lead their art creativity and motivation in art. The Cheongju Art Studio accepts about 20 artists each year. Each artist is provided with their own studio a bathroom and a small kitchen area. The studio is spacious with a high ceiling. It is designed as a loft where an artist can work and sleep, and is open 24 hours a day. inside and outside of the city. Each year we curate two to three group shows. We also host an open studio and several artists workshops in which artists give public presentations on their work. The unfurnished studio is provided with a small private bathroom and kitchen area. - Artists who work actively in their field. - Portfolio (We ONLY accept MS PowerPoint presentation and PDF format) or Digital files should be JPEG and no more than 15 images. * Video files require for Multimedia applicant, Max. 10mins, with AVI format. STEP 3. Short Interview if you reside in Korea.